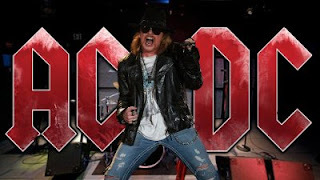 While it has not been confirmed, AC/DC biographer Murray Engleheart has said that the band will continue both recording and touring with Axl Rose as the frontman. Speculate all you want but I’ve said it before and I’ll say it again: AC/DC will continue with Axl on vocals - new album, touring, the whole nine yards. What was a massive gamble by Angus turned out to be an equally enormous triumph that has set the scene for the future. Engleheart wrote the 2008 biography AC/DC: Maximum Rock and Roll and the liner notes for the band's Bonfire box set and is known as an authority on the group. Angus Young is the only remaining original member of AC/DC in the band. Steve Young, who had been a touring guitarist with the band in the late-80's, was brought in to replace Malcolm Young in 2014 when he left due to a diagnosis of dementia. Chris Slade, who had previously played drums with the band from 1989 to 1994, took over for Phil Rudd after he was arrested on a number of charges. Rose was a "temporary" replacement for Brian Johnson who left in 2016 due to significant hearing damage.